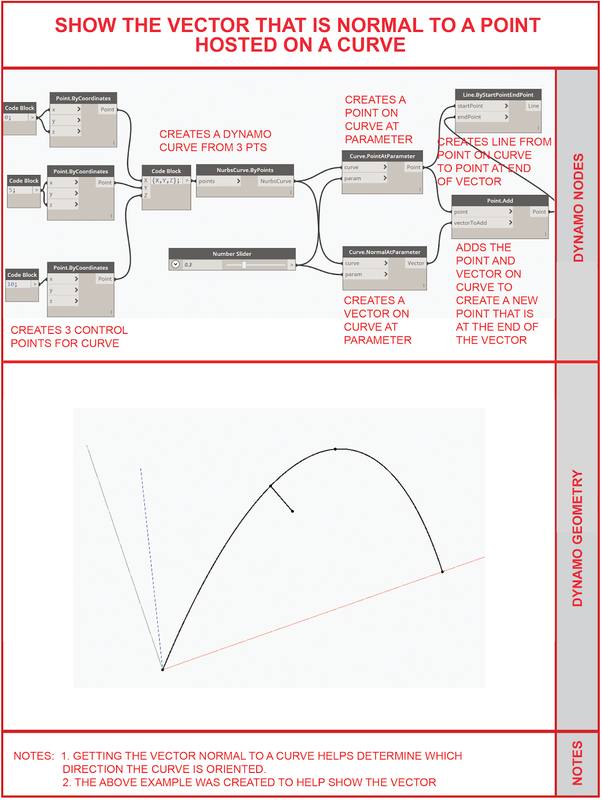 Have you ever wanted to know how to show a vector that is normal to a curve in Dynamo? Just follow the image below and learn how! The next question is why would you ever want to know this? Why would you not want to know it? If you have a curve, placing a vector and showing its direction normal (perp) to your curve reveals a lot about the local behavior of your curve, including what direction the curve would offset when you need to move the curve. There are many other ways to show the orientation and normal vector to a curve. This is just one method. Also, OOTB Dynamo does not show a physical representation of a vector so using a single straight line to represent the vector is helpful to visualize the abstract vector. 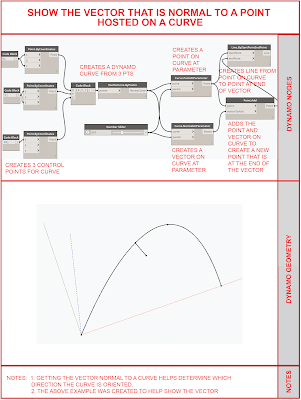 The question is why, when creating a vector in dynamo, it does not display. However dynamo will display a plane and IMHO that is just as abstract as a vector. Oh well. Let us not wait for that to happen and use the method above to visualize that vector!